Earlier this year, we launched a survey to collect information on the adoption of flexible work initiatives, or what we call Anytime, Anywhere Work™ programs within public accounting firms. We were pleased in this third year of conducting the survey to receive 160 distinct responses from firms ranging in size from small (2 – 5 CPAs) to Big 4. 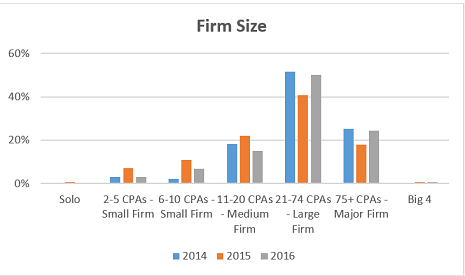 Similar to last year, the majority of respondents came from large (21 – 74 CPAs) and major firms (75+ CPAs). 61% of our respondents were either HR professionals or Firm Administrators. 20% were Managing Partners, and the remainder of responses were received from Partners, Managers and Marketing Professionals. In this blog, we’ll share the positive and negative results firms experience as a result of their flexible work programs. We’ll start by discussing the pros of Anytime, Anywhere Work, which far outweigh the cons. Like in years past, the most popular positive result that firms experience from their flex programs is that it “Allowed team members to experience better work/life integration.” And we aren’t surprised by the fact that it “Improved our recruiting story” moved ahead of “Enhanced morale or engagement” as second place in the ranking of positive results. Firms are looking for every advantage in the war for talent and those who are leveraging their flexible work practices to differentiate themselves in the CPA recruiting marketplace are seeing positive results. One survey participant shared that they’ve been named a “When Work Works” winner for their flex policies and featured on the AICPA’s website for their innovative practices, two awesome opportunities to showcase their brand. As we predicted in last year’s blog on these questions, the number of respondents who identified “Relieved space constraints” has increased from 18 to 35 responses. Building lease costs tend to rank as the number two expense on most income statements, so it’s no surprise that firms are looking for relief by having team members perform more work remotely. We’ll dig more deeply into the topic of Anywhere Work in a future blog, sharing some specific strategies that firms are employing to manage space constraints and building lease costs. We were excited to see that our new response choice, “Created a culture of trust and mutual respect,” was a benefit realized by 65, or 41% of the 160 respondents. Allowing team members to choose the time and place to work places trust in them to get the work done in a manner that fits best for them. In our experience, talented individuals greatly appreciate that trust, which converts into higher levels of engagement and loyalty to the firm. Anytime, Anywhere Work programs can create or highlight challenges as well, so we asked participants to identify the top difficulties they experience when implementing flexible work programs. For the third year in a row, “Has made communication more difficult” appears as the top challenge that firms face in managing Anytime, Anywhere Work arrangements. We regularly work with firms on effective communication strategies and aren’t surprised that it shows up as a challenge in this area as well. While we recognize communication can be more challenging in a flexible work environment, there are best practices and strategies to mitigate the issues that arise. In a future blog in this series, we’ll share some specific best practices along with the “one piece of advice” received from our survey respondents, which will definitely include strategies to improve communication in a flexible work environment. This year the negative result “Has highlighted some performance issues we have with staff” moved up to 4th in the ranking. If your firm is struggling to hold team members accountable, either those in a flexible work program or others, see our blog entitled You Don’t Have to Be a Jerk to Hold Your Team Accountable for three things you can do to improve your ability to manage underperforming team members. We also believe you should retain the right to modify or rescind a participant’s right to participate your flexible work programs if the arrangement isn’t proving successful for the firm or the firm’s clients. In the comments on negative results, two participants noted that those left in the office bear the burden of training and assisting others. If that sentiment exists in your firm, stay tuned for our upcoming blog on technology and be sure you are leveraging simple tools available to share screens and stay in touch, even when you work in different locations. Your Anytime, Anywhere Work participants can train others and be available for questions just as effectively as those in the office, and we’re proof it can be done! ConvergenceCoaching is a fully virtual organization and recently hired and trained a new team member without ever meeting her in-person. We think it’s telling that the total positive result responses (579) outweigh the negative (267) by more than 2 to 1. Clearly firms are developing the necessary strategies to overcome the potential negative impacts that flexible work programs can bring and reaping the rewards in their retention and recruitment efforts. What changes or improvements to your Anytime, Anywhere Work programs will you pilot to realize more benefits and mitigate challenges in 2017? We hope you’ll use this blog to start planning today! And be sure to watch for our next blog in this series, where we’ll dive deeper into the types of programs firms are implementing to flex time. Stay tuned!